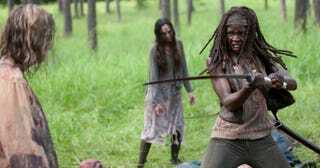 Walking Dead Live Thread. Caution: Spoilers Aplenty. The episode encapsulation reads: "Rick is faced with multiple immediate threats, while other group members deal with the past". So maybe we'll get some sweet backstory action. ETA: Stay tuned for Kookaburracho's Talking Dead thread immediately following.